An absorbing ethnography of an all-but-ignored people. Cuts through layers of falsehood and romanticism to harsh realities that reveal as much about non-Roma as it does about the Gypsies themselves. A masterful work of personal reportage, this volume is also a vibrant portrait of a mysterious people and an essential document of a disappearing culture. 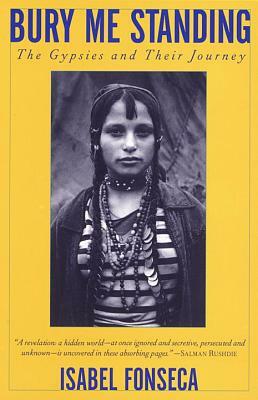 Fabled, feared, romanticized, and reviled, the Gypsies—or Roma—are among the least understood people on earth. Their culture remains largely obscure, but in Isabel Fonseca they have found an eloquent witness. In Bury Me Standing, alongside unforgettable portraits of individuals—the poet, the politician, the child prostitute—Fonseca offers sharp insights into the humor, language, wisdom, and taboos of the Roma. She traces their exodus out of India 1,000 years ago and their astonishing history of persecution: enslaved by the princes of medieval Romania; massacred by the Nazis; forcibly assimilated by the communist regimes; evicted from their settlements in Eastern Europe, and most recently, in Western Europe as well. Whether as handy scapegoats or figments of the romantic imagination, the Gypsies have always been with us—but never before have they been brought so vividly to life. Includes fifty black and white photos. Isabel Fonseca grew up on New York City. She went to Barnard College and Oxford University before settling in London, where she worked as an editor at the Times Literary Supplement. She has written for the Times, The Guardian, The Economist, Harper's Bazaar, The Wall Street Journal, The New Yorker, and The American Scholar, among other publications. Since its appearance in 1995, the national bestseller Bury Me Standing has been published in twenty-two countries. Fonseca is also the author of a novel, Attachment. She lives in Brooklyn, New York, with her husband, Martin Amis.